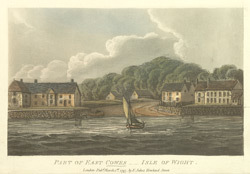 View of East Cowes in the Isle of Wight. Historically Cowes was one of three ports on the island and was known as Shamblord. It is not known where the name Cowes comes from although it might be from two sandbanks outside the harbour (in the 15th century sandbanks were known as cowes) or it could be that the name is derived from the two castles that were built here in the 16th century by Henry VIII to defend the coast from invasion. Cowes is divided into East and West Cowes by the River Medina. Historically East Cowes was the larger settlement however in the early 19th century the Royal Yacht Squadron was founded on the western banks of the Medina and since this time West Cowes has grown in size and importance.